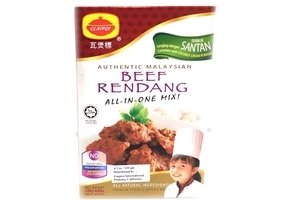 Clay Pot Authentic Malaysian Beef Rendang Mix in 4.23oz (120g) pack. Claypot Beef rending Mix Complete with Coconut Cream Powder. Rendang is a spicy meat dish which cooked slowly using the coconut milk. NO Msg added. Served 4-6. Product of Malaysia. Halal Certified حلال .